Important Made in USA Origin Disclaimer: For certain items sold by Walmart on Walmart.com, the displayed country of origin information may not be accurate or consistent with manufacturer information. For updated, accurate country of origin data, it is recommended that you rely on product packaging or manufacturer information. 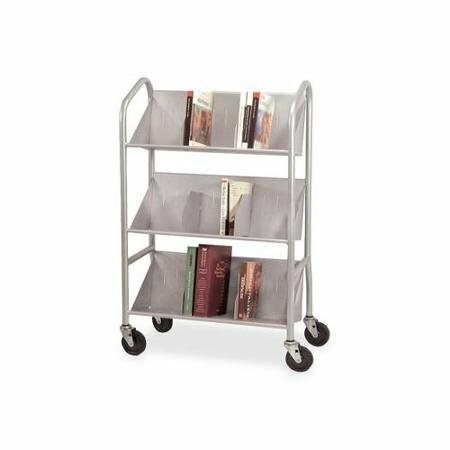 Shelf cart features three sloped shelves to easily carry books and manuals. Design includes three 9-1/2" deep sloped shelves with six steel dividers and 12" clearance between shelves. Shelf cart rolls on 4" casters. Weighs 53-1/2 lb. Made of metal.